Finally! 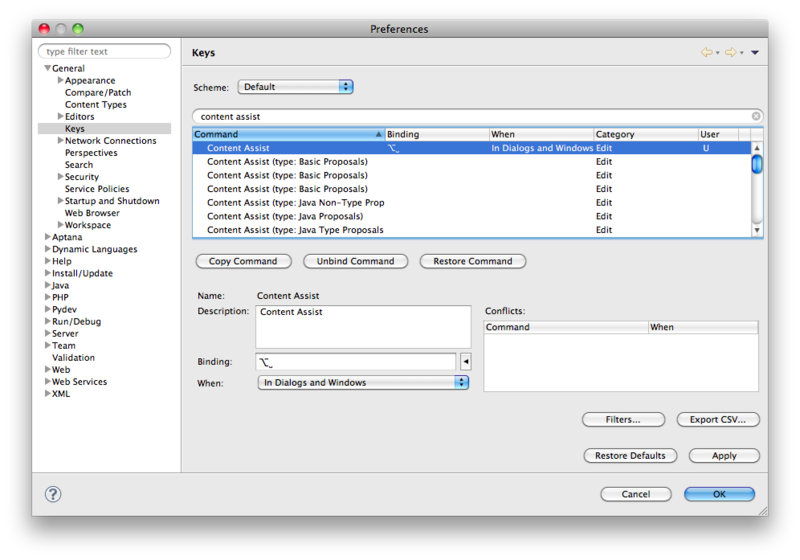 I found how to get the keyboard shortcut for code completion working in Eclipse on Mac OS X. At work, on Linux, I use CTRL-SPACE all the time in Eclipse. Unfortunately that did not work on my MacBook: CMD-SPACE triggers the spotlight search widget and CTRL-SPACE is tied to the Quicksilver launcher in my case. And there was much frustration. First: don't say "code completion", but "content assist" in Eclipse. To bring even more confusion, there is also the "word completion" tool in the edit menu, but that's not what you normally want (it's just limited to completing a variable name without much context sensitivity). "Content assist" offers you the usual suggestions you expect from a completion tool (function names, variables, methods, properties, modules, ...). Once I got this, it I just had to edit the keyboard shortcut for "content assist" to something that was still available (I chose ALT-SPACE).